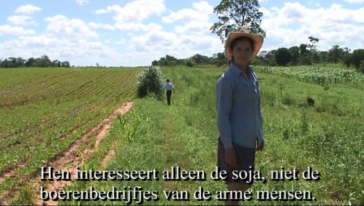 VoedselsoevereiniteitFood sovereignty is the right of peoples to healthy and culturally appropriate food produced through ecologically sound and sustainable methods, and their right to define their own food and agriculture systems. It puts those who produce, distribute and consume food at the heart of food systems and policies rather than the demands of markets and corporations. 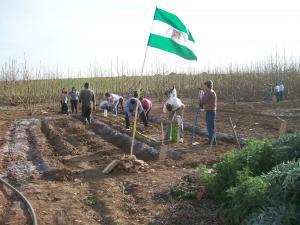 For ASEED the term functions as an umbrella for the the alternative food system and society we fight for. 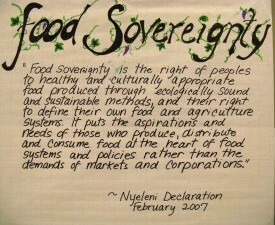 Food sovereignty is the right of peoples to healthy and culturally appropriate food produced through ecologically sound and sustainable methods, and their right to define their own food and agriculture systems. It puts those who produce, distribute and consume food at the heart of food systems and policies rather than the demands of markets and corporations. For ASEED the term functions as an umbrella for the the alternative food system and society we fight for. Hier volgt een artikel over voedselsoevereiniteit dat in februari 2011 is verschenen in de Buiten de Orde, het blad van de Vrije Bond. Op een aantal punten is de tekst geactualiseerd. Eten is een eerste levensbehoefte en iedereen is daar dagelijks mee bezig. In Nederland is nog maar een klein percentage van de bevolking werkzaam in de landbouw, maar wereldwijd gaat het om miljarden mensen. Zij zijn afhankelijk van de verkoop en consumptie van de voedselgewassen die ze op eigen stukje grond hebben geproduceerd. Maar hun positie wordt bedreigd. 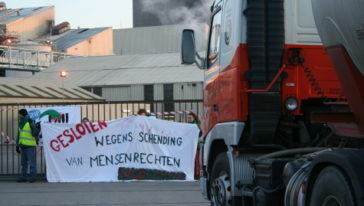 Thursday April 17th, the international day of farmers struggles, the group Agrocrisis blocked a Cargill company firm in the harbour of Ghent, Belgium. Some 30 activists began the action at around 6h30 in the morning and lasted until after 5 p.m. During all that time, not one truck with soy could enter or leave the firm. Some activists had locked themselves with pipes and bicycle chains at the gate, so it was impossible to open the entrance without brute force. The staff of the firm, scared of bad publicity, chose therefore to let the activists occupy the gate and didn't ask the police to intervene.